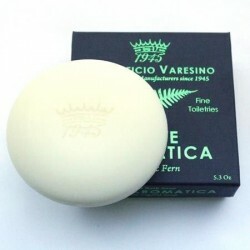 The Aromatic Fern or Felce Aromatica bath soap has a fragrance with top notes of citrus and bergamot, spicy aromatic mid scents of pepper and ginger and base notes of amber, patchouli and sandalwood which compliments the shaving soap and after shave balm. The Aromatic Fern or Felce Aromatica bath soap has a fragrance with top notes of citrus and bergamot, spicy aromatic mid scents of pepper and ginger and base notes of amber, patchouli and sandalwood and compliments the shaving soap and after shave balm. Made with 100% natural ingredients with no chemical preservatives. Soap supplied wrapped in tissue paper in a high quality black box with a metallic embossed labelling. 150g.